The average cost of memory care in Cumberland County is $3,550 per month. This is lower than the national median of $4,650. Cumberland County sits on top of a mountain between Knoxville and Nashville and has a population of 60,000, more than 30 percent of whom are over the age of 65. For residents with Alzheimer's disease and other forms of dementia, Cumberland County has two memory care facilities. Memory care facilities in Cumberland County, as is the case in all of Tennessee, are licensed by the state's Department of Health and are referred to either as assisted care living facilities or as residential homes for the aged. Cumberland County residents experience the change of seasons. Its location on a mountain keeps it cooler than most of Tennessee, with summer highs averaging 84 degrees. Winters can be chilly. Night time lows regularly drop below 30, and the area gets 10 inches of annual snow. But with 208 days of yearly sunshine and plenty of days with the temperature in the comfortable range of 70 to 80 degrees, Cumberland County offers memory care residents plenty of opportunities to get outside for fresh air. The cost of living in Cumberland County is 13 percent below the national average, making it an ideal retirement location for budget-conscious seniors. That said, memory care patients should be aware that health care is the one area where costs are much higher in Cumberland County than in most places. Cumberland County is a tax-friendly place for seniors and retirees. 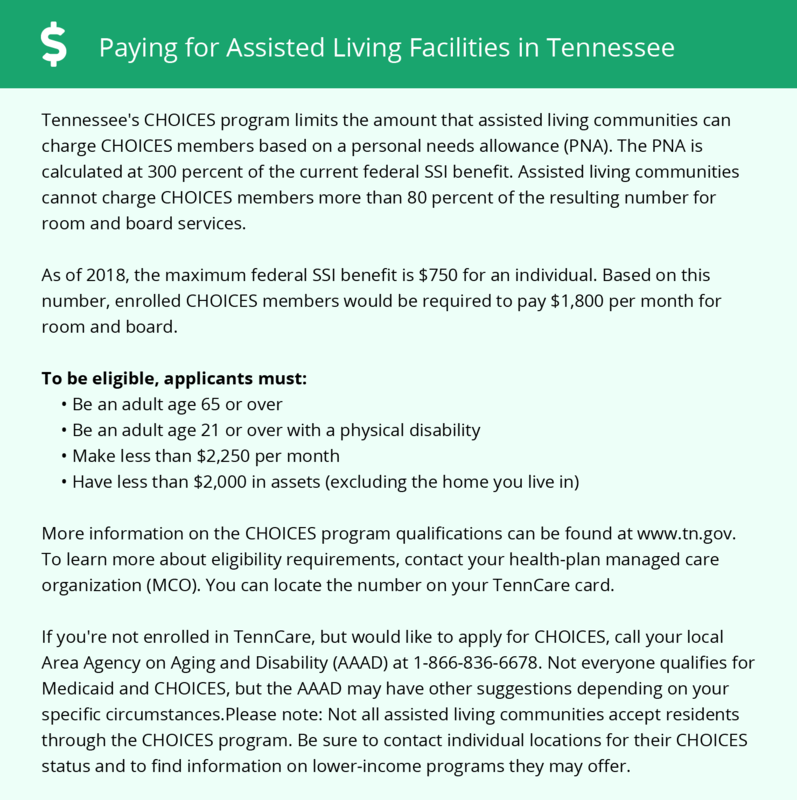 Tennessee has no state tax on income, Social Security or retirement benefits, and its property taxes are much lower than average, a possible benefit to family members considering relocating to be near their loved one in memory care. New residents to the area may want to keep Tennessee's sales tax in mind, which ranks among the nation's highest. The rates of violent and property crime in Cumberland County, both at 39 out of 100 compared to the national averages of 31.1 and 38.1, are slightly elevated. Most memory care facilities are very safe places and offer a number of security features to protect residents. Memory Care costs in Cumberland County start around $3,550 per month on average, while the nationwide average cost of memory care is $4,753 per month. To see a list of free memory care resources in Cumberland County, please visit our Assisted Living in Tennessee page. Cumberland County-area assisted living communities must adhere to the comprehensive set of state laws and regulations that all assisted living communities in Tennessee are required to follow. Visit our Memory Care in Tennessee page for more information about these laws.